Josh Ritter's new album 'Fever Breaks' was produced by Jason Isbell and features Jason, Amanda Shires and contributions from the 400 Unit. Sounds like a match made in heaven, doesn't it?! Rolling Stone calls the collaboration "...classic Ritter on Muscle Shoals-bred steroids." The album was recorded by engineer-of-the-moment Matt Ross-Spang (Isbell, Margo Price, John Prine, Anderson East) and will be out on Friday, April 26th. Josh Ritter will perform a live set at Grimey's in celebration on release day! 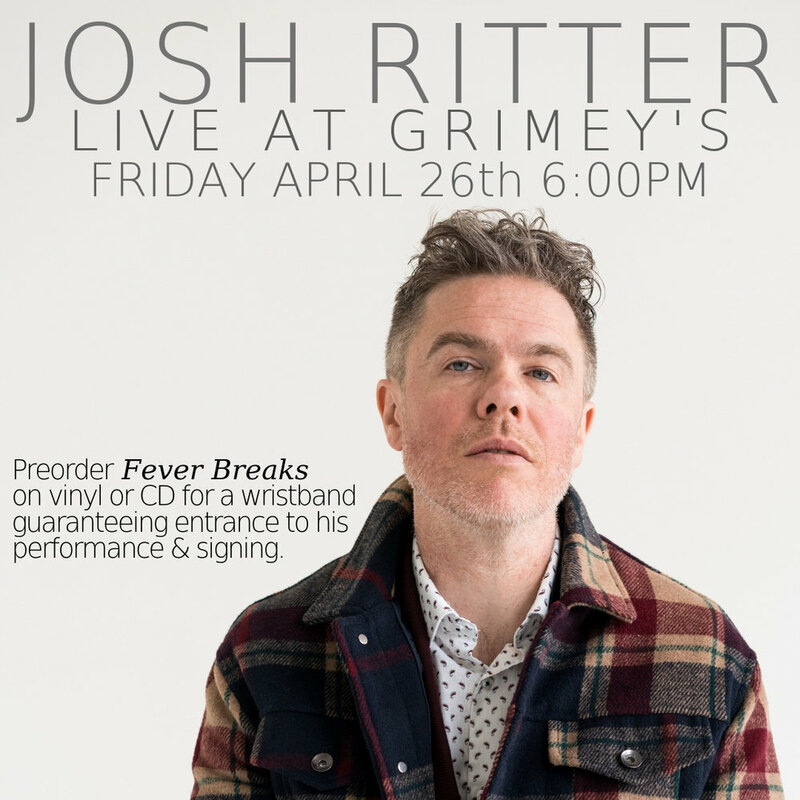 Starting tomorrow, Wednesday, April 10th, at 10AM, stop in Grimey's to preorder your copy of 'Fever Breaks' and you'll receive a wristband guaranteeing you get in for Ritter's live performance at 6PM on Friday, April 26th. The CD is $10.99 and the indie exclusive coke bottle clear vinyl is $18.99. We will take preorders in person at Grimey's on Wednesday and Thursday, then this Friday, April 12th, at 10AM you can preorder online at https://www.grimeys.com/preorders/josh-ritter to lock in your spot. Josh Ritter and Jason Isbell toured together in 2016 and discovered a special musical connection. That led to Ritter asking Isbell to produce this new record. Isbell said yes, but having not produced an album in a few years, he had doubts that he could pull off the project "without dropping the ball." After some thought (and a conversation with Shires, who is a long-time fan of Josh's), he told Ritter he'd come onboard if they could record in Nashville with the 400 Unit and the engineer of his choice, terms to which Ritter readily agreed. And we get this stellar new album as a result! Don't miss your chance to see Josh Ritter perform an intimate set at Grimey's. The performance will be followed by a signing and you will need a wristband to go through the signing line.